EDITION: 2010 | You can read a spec sheet to get a glimpse at everything that fi ts onto these long-haul masterpieces, but you have to ride a 2011 Touring motorcycle to really understand what makes these some of the greatest long-range bikes around. Everything from the stiff backbone frame to the four-point engine isolation system to the 70 lbs of luggage capacity and state-of-the-art sound system puts these regal machines out ahead of the competition. 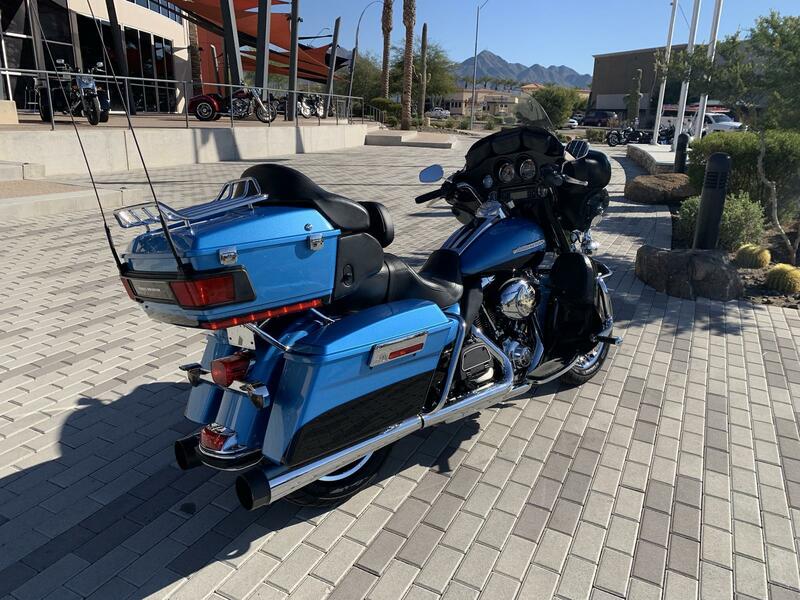 The 2011 Harley-Davidson Electra Glide Ultra Limited FLHTK is a premium featured touring bike full of authentic Harley-Davidson grand American touring style. 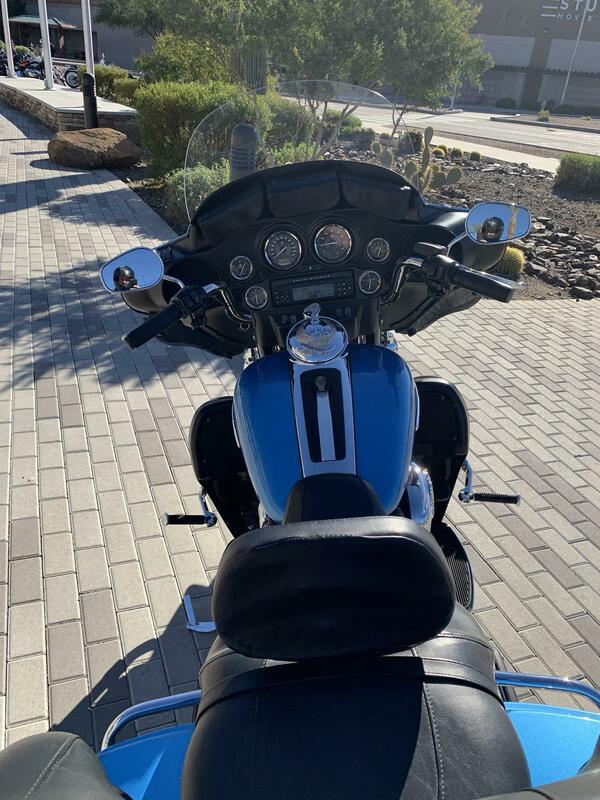 Some of the bike's premium features include: ABS brakes, heated hand grips, titanium face gauges, Tour-Pak inserts, a premium Tour-Pak luggage rack, 28-Spoke contrast chrome wheels, and special Ultra Limited identifier medallions. Also found on the Harley Electra Glide Ultra touring bike is a 6 gallon fuel tank so you have to stop less for fuel. Harley has many other motorcycle touring bikes, all to provide you with comfort and style. 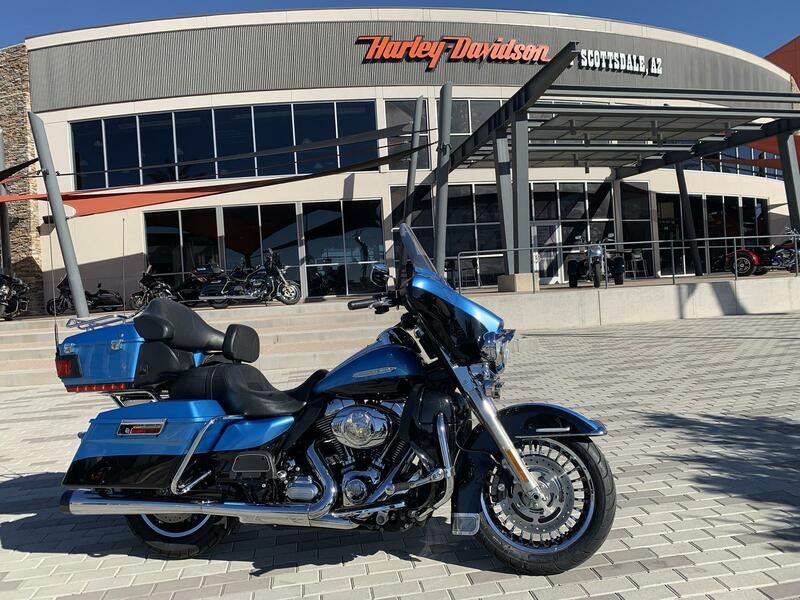 Be sure to look at the new Road Glide Ultra with its frame mounted Harley fairing for your motorcycle travel as well as all of the other Harley touring motorcycles. Check out some other Harley-Davidson motorcycles such as the Night Rod Special motorcycle cruiser, the V-Rod Muscle power motorbike, or the Softail Deluxe motorcycle cruiser. 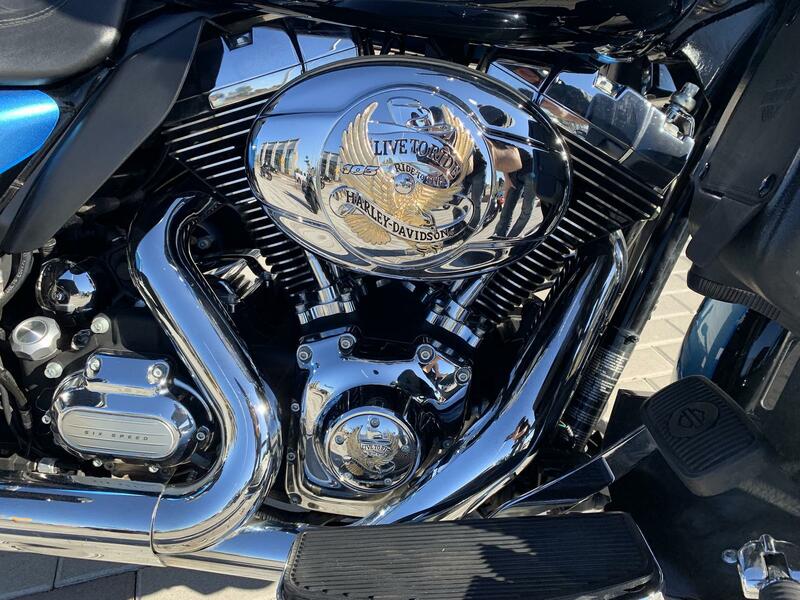 Iconic Engine Twin Cam 103™ engine heritage: The knowledge of what makes an engine truly move a rider runs deep at The Motor Company, and it was put to good use when we created the Twin Cam 103™ engine. We sweated bullets perfecting every cubic inch, pushing design and technology forward. And we did it all without compromising one bit of Harley-Davidson's unique styling. Evolved, yet carrying on the legacy of the Flathead, Knucklehead, Panhead, Shovelhead, Evolution®, Twin Cam 88®, and Twin Cam 96™ engines that came before. The performance and durability are a direct result of the untold miles logged on the V-Twin since 1909, and the proud heritage that comes from a century's worth of commitment to life on two wheels. Twin Cam 103™ engine innovation: Fire up the Twin Cam 103™ engine and feel the low-end torque unleashed. Thanks to the lightweight piston design, delivery of the added power is more refined than ever. Then put your foot on the shifter and feel how the engine and Six-Speed Cruise Drive® transmission were designed to work together. Six speeds. A strong driveline and strong internal parts. Low routine maintenance. And a low cruising rpm couldn't feel better. Together with the H-D® Smart Securtiy System and Anti-Lock Brakes, the Twin Cam 103™ engine headlines the "PowerPak" option that comes standard on the Electra Glide® Ultra Limited. Pure Harley-Davidson® styling: Feast your eyes on the Twin Cam 96™ engine and there's no mistaking its roots. This is authentic Harley-Davidson® style through and through with an attention to detail you won't find from any other motorcycle company. Black powder-coated heads and cylinders are highlighted by polished rocker covers. It's a jewel machined out of metal. Pure. Dripping with power. From the classic edge of the cooling fins to the clean lines of cases and covers--the Twin Cam 96™ engine makes an ironclad statement to holding on to what's right and staying true to what satisfies the rider. Six-Speed Cruise Drive®: You want a ride that rumbles--not begs for mercy--when you lean on it a little. The Six-Speed Cruise Drive® transmission provides smooth, quiet shifting and reduces engine speed on the highway, so you get a better match between engine turnover and road speed. It's a rare ride when a bike responds like this, and a low growl goes a long way when you're opening up the road ahead. Four-point engine isolation system: After three decades of keeping the vibrations of the Big Twin from getting to the rider, Harley-Davidson® engineers decided to take something that is already great and make it even better, perfecting the delicate balance of shake, rattle and ride--comfortably. In 2009, we added a fourth isolation point to our three-point rubber engine isolation system. Just get that Big Twin idling and feel the difference. Classic Harley-Davidson® rumble: Iconic, fierce, the most distinct decibels you'll ever hear bouncing off city canyons or scenic country landscapes. The sound of a Harley-Davidson® motorcycle has a rich history of its own. It's a classic roar. It's the sound of freedom, soul and self-expression. Technology 80W Harman/Kardon® advanced audio system: Naturally, the king of the road gets some royal extras. The premium Harman/Kardon® audio system boasts great sound for booming down the boulevard and highway, and, yeah, it might as well go to 11. It's loud, proud and comes with AM/FM receiver, CD and MP3 player, four speakers--even an intercom and CB. When it comes to hearing your tunes over the roar of the road or just keeping your own chatter free and easy, this system has it all. Tour-Pak®-mounted 12V power supply: No limits. Only horizons. That's the feeling of a Harley-Davidson® motorcycle. But you may have a few gadgets that disagree. Whether you need a quick charge for your cell phone or power to blow up an air mattress on a lonely stretch of road, knowing you've got 15 amps of power to get through day or night goes a long way. And don't worry about pesky rain spoiling your power supply--the spring-loaded cap keeps the receptor dry and free of road muck. High output accessory connector: Harley-Davidson® touring means maximum comfort in all conditions and the capacity to add whatever enhances and personalizes your ride. The high output charging system provides an electrical capacity robust enough for your add-ons: heated vests, heated seats, heated handgrips, lights to showcase the engine, you name it So if you're hell-bent on two-wheeling it, we make sure you've got the juice to do it your way. Cruise control: If you're ready to take touring to the next level the standard cruise feature will help you settle in for the long haul. Get the comfort of the cruise without the cables cluttering up your handlebar. Our electronic throttle control technology makes it possible to have the best of both worlds. Anti-lock brakes: When it comes to the Ultra Classic® Electra Glide® model with standard ABS, "stopping power" has a double meaning. The components of our ABS are tastefully hidden within the wheel hub, so you'll still turn heads with clean, streamlined designed. More importantly, though you get certainty in the saddle knowing your bike's going to behave when you need it. Artfully hidden technology: Harley-Davidson® leverages the latest in technology without compromising style and function. That means we hide electronics. The whole wiring harness is skillfully routed behind the jewels of the bike--the tank, engine and all the other eye-popping features you want to see. It's just another way The Motor Company goes the extra mile to give its bikes that premium, top-of-the-line fit and finish. Intuitive controls: Hand controls on a Harley-Davidson® motorcycle are incredibly intuitive. The turn signals are self-canceling and, based on the speed and angle of the motorcycle, they know how long to stay on. 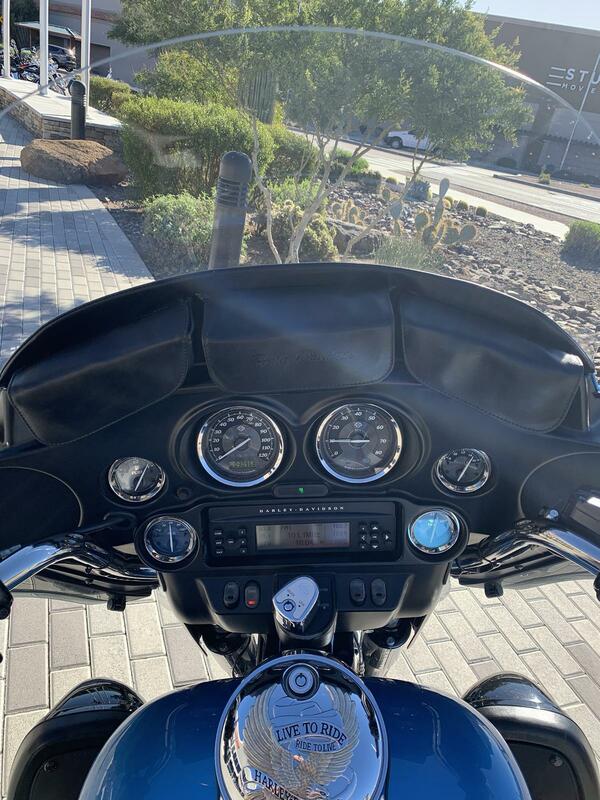 Engaging the controls quickly becomes second nature so you can focus less on turning off your signal and more on basking in the freedom of the ride. H-D® Smart Security System: The factory installed next-generation security system features a hands-free fob that automatically arms and disarms the vehicle electronic security functions as you approach and walk away from the bike. Stick the fob on your ignition key ring and let it do all the work. It's this attention to details and security that make Harley-Davidson® motorcycles unique. Handling Frame and swingarm: Change everything. Lose nothing. Our complete redesign of the frame and swingarm has only been around since 2009, and it's already changing the game entirely. 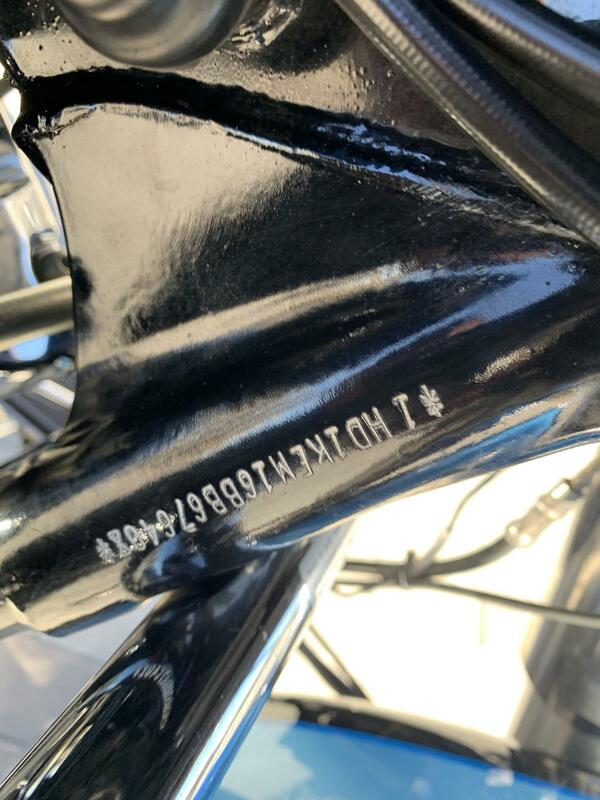 Stamped and welded parts and bent tubing were ditched for strong castings and forgings--just like the legendary Harley-Davidson frames of years past. The result is a frame that rides rigid and owns the corners. The acceleration is strong. The ride is tight and responsive. And the feel on the road is confidence inspiring. Legendary low speed maneuverability: At The Motor Company, we believe you don't make innovative, next-generation Touring motorcycles without shedding a little blood, sweat and tears. And when you get it right--like with the low speed maneuverability on our Touring models--all the other upgrades in the ride combine to create a big-boned bike that is light and nimble while carving up tight turns or if you find yourself riding in a parade or group ride. Fine-tuned front end geometry: H-D® might as well stand for "handling details." Here's another key engineering innovation we added because we refuse to settle. Starting in 2009, we took an already royal ride and fine-tuned the front end further, adding just enough trail to make it even more responsive. You might not fully appreciate the difference until you're tucked into a long twisty, sewn to the saddle and fully in tune with every curve of the road. Dunlop® Multi-Tread™ tires: The 180mm back tire reengineered in 2009 does more than fill out the rear fender and put a bigger patch of rubber on the road. Dunlop® Multi-Tread™ technology uses harder compounds at the center and softer on the sides for a tire that still knows how to knuckle-down on corners. Perfect for making this bike agile on every curvy stretch of road. And the way it feels going through an abrupt off-camber turn will put a grin on your face that'll last to the next state line. Brembo® brakes: Confidence. Control. High-performance dual disc Brembo® brakes offer consistent stopping power at all speeds. The 4-piston front and rear caliper with dual front rotor brake system is state of the art and top of the line. It's just another way The Motor Company puts a high level of detail into their bikes to give you peace of mind throughout your journey. Air-adjustable suspension: With air-adjustable suspension that comes standard, you can dial in your ride to accommodate heavier or lighter payloads, battle unexpected road conditions or simply set it to how you like to roll. The lighter the load, the softer you can go by decreasing the air pressure a bit, or increase the air pressure for a more firm ride. A convenient air valve is located between the saddlebag and rear fender for quick adjusting. It's all about rider and passenger comfort and setting your bike to fit your taste--the easy way. Tuned to be ridden: Harley-Davidson® motorcycles are different from any other bike out on the road. There's a balance to them. The steering, the maneuverability--it's all in concert. And each Harley-Davidson® model is tuned differently to create a unique riding experience for each individual no matter which bike they swing their leg over. Let's face it, we didn't get to where we are by being like everyone else. Comfort Heated hand grips: When the chill gets at you, just having a little heat would be nice enough. But this is a Harley-Davidson® motorcycle, and we're all about the details. Our heated handgrips have six settings, so you can easily adjust on the fly for the heat you need with the versatility and control you come to depend on. 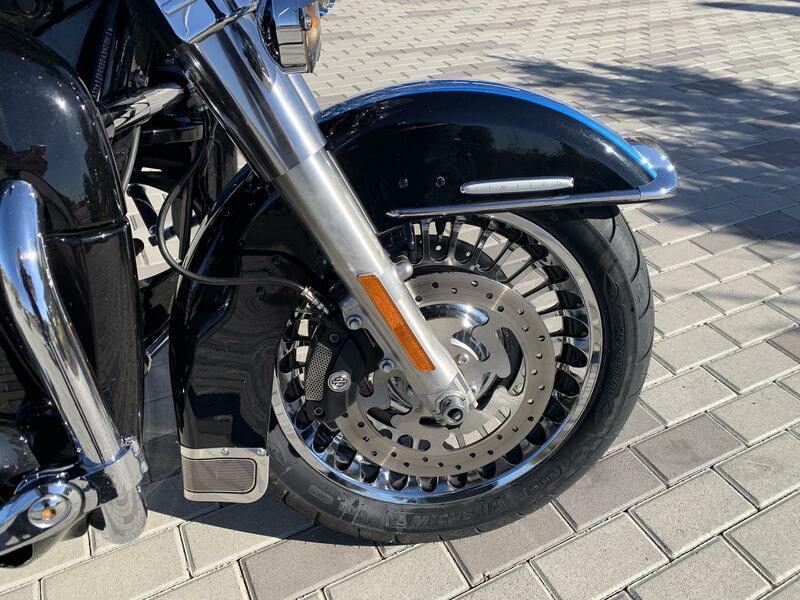 8-inch Ultra windscreen: Beyond the Grand American Touring appearance of this windshield, an 8-inch Lexan® wind splitter is all it takes to keep the wind from getting in the way of you and your ride. Get clear visibility without buffeting, and bit more comfort when the wind really wants to throw you around. Yet another detail that makes our Electra Glide® models the best in class for Touring comfort with long-distance performance. 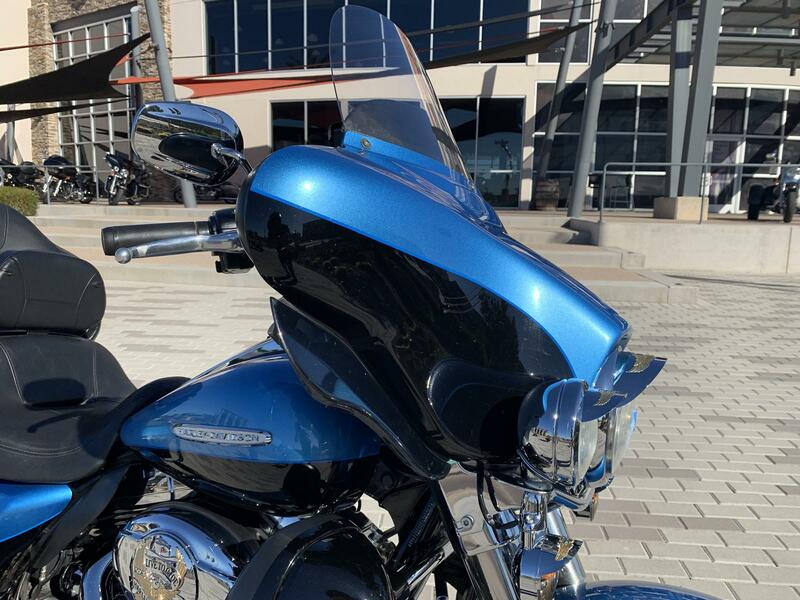 Vented fairing lowers: Don't be a prisoner to the elements outside--take control of your ride with the color-matched faring lowers on the Ultra Classic® Electra Glide® model. Pop them off for a cooler ride or leave them fixed to fight the wind tooth and nail. Use the lockable glove boxes to empty your pockets, ditch your phone, and ride free. When it comes to Touring, Harley-Davidson® is all about optimal comfort every time you hunt down a horizon. New Two-Up seat with passenger backrest: Another classic feature revamped in 2011 without sacrificing an ounce of nostalgic style: the newly sculpted seat with a deeper contoured bucket and narrower neck. This ultimate Touring saddle relieves pressure on your thighs, while providing more back support and comfort for a wide variety of rider sizes. And the lower seat height--26.5 inches to be exact--puts your feet closer to the road to enhance your confidence. In back, a passenger backrest is integrated into the Tour-Pak® lid with wrap-around armrests to add to your riding partner's comfort. It's science in service of comfort, and your way to beat fatigue over the long haul. Full-length footboards: Your boots were made for riding, in any way you see fit. Our full-length footboards boast a tried and true design that's stood the test of time. Plenty of foot positions for your taste and comfort. Rubber vibration isolation for a comfortable ride. And heel-toe shifting for confident shifting every time. It takes a few rides, but once you've gotten used to the smooth heel-toe rhythm, you'll never give it up. The toes of your boots won't take the same beating, either. Wide set handlebar: Classic style and maximum comfort. That's the perfect balance of the wide set handlebars that come standard on the Road King® model. They're designed to keep you comfortably propped in a commanding position while making sure your neck muscles stay calm and relaxed mile after mile, state after state. 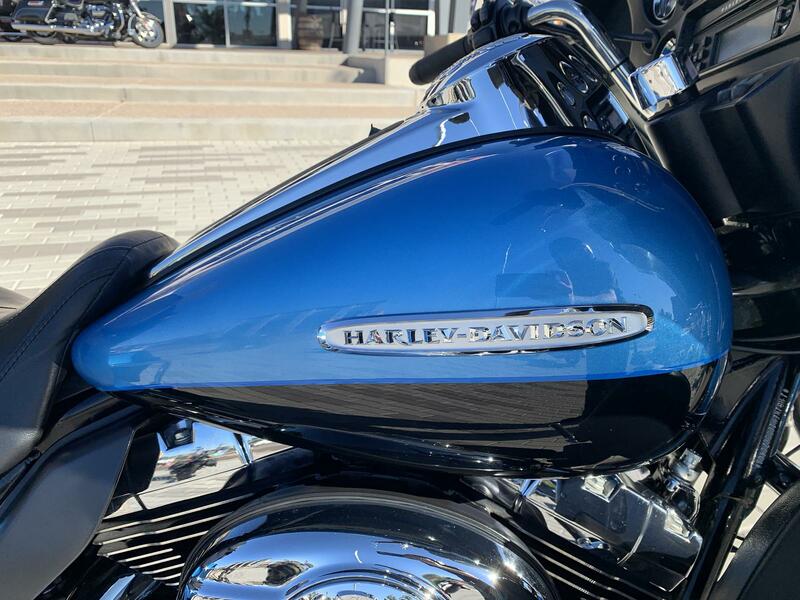 Durable stainless steel insures the structural rigidity you expect from a Harley-Davidson® motorcycle with the deep, lustrous finish you desire. 2-1-2 exhaust: Welcome to the crossroads of pure Harley-Davidson® style and smart engineering. 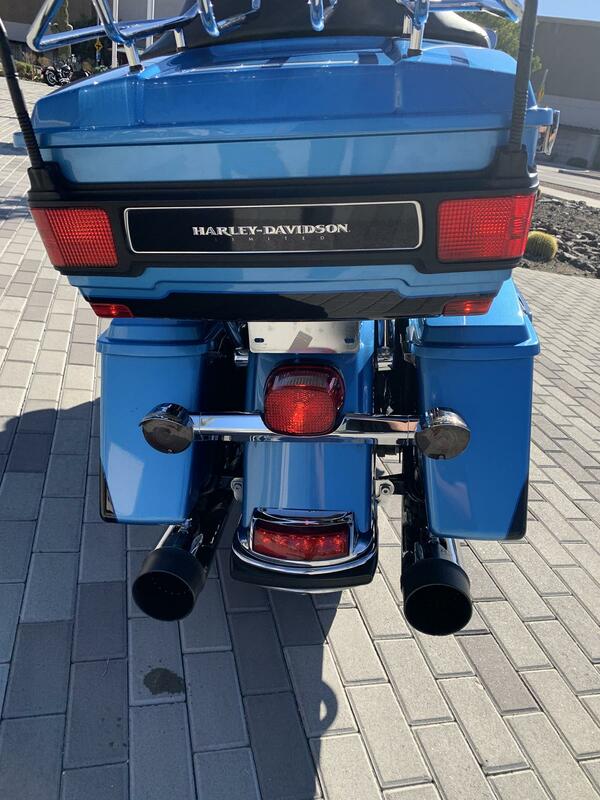 The "Tommy Gun" 2-1-1 exhaust helps direct heat away from the rider and passenger, while providing ample performance, signature Harley-Davidson® rumble, and big style. Engine idle temperature management strategy: Our motorcycles are built to be ridden. A lot. So that means that rider comfort is top of the mind. Always. With the Engine Idle Temperature Management Strategy (EITMS) feature, the motorcycle automatically cuts fuel and fire from rear cylinder when idling, which helps reduce engine heat felt by rider and passenger. This feature can easily be turned on by your dealer. Seat engineering and design: The seat is home for Harley-Davidson® motorcycle riders. They want a seat that has unique style without sacrificing comfort. Because of that, Harley-Davidson® invests a lot of time in researching, designing and testing seats so that every bike has just the right saddle. Dimensions Length: 98.6 in. (2525 mm) Seat Height, Laden: 27.3 in. Seat Height, Unladen: 29.1 in. (745 mm) Ground Clearance: 5.1 in. (130 mm) Rake Steering Head: 26° Trail: 6.69 in. (170 mm) Wheelbase: 63.5 in. (1625 mm) Fuel Capacity: 6 gal (22.7 l) Oil Capacity: 4 qt. (3.8 l) Dry Weight: 857 lbs. (400 kg) Running Order: 901 lbs. (413 kg) Powertrain Engine: Air-cooled, Twin Cam 103™ Displacement: 1690 cc (103 cu. in.) Bore x Stroke: 3.875 in. / 4.38 in. (98.4 mm / 111.1 mm) Engine Torque: 102 ft. lbs. @ 3500 rpm (J1349, 135 Nm @ 3250 rpm) Fuel System: Electronic Sequential Port Fuel Injection (ESPFI) Compression Ratio: 9.6:1 Primary Drive: Chain, 34/46 ratio Fuel Economy City: 35 mpg (6.72 l/100km) Fuel Economy Hwy: 54 mpg (4.36 l/100km) Gear Ratio, 1st: 9.59 Gear Ratio, 2nd: 6.65 Gear Ratio, 3rd: 4.938 Gear Ratio, 4th: 4 Gear Ratio, 5th: 3.407 Gear Ratio, 6th: 2.875 Wheels/Tires Wheels Front: Contrast Chrome, 28-spoke Cast Aluminum Wheels Rear: Contrast Chrome, 28-spoke Cast Aluminum Tires Front: NW 130/80B17 65H Tires Rear: NW 180/65B16 81H Electrical Instruments: Fairing-mounted electronic speedometer with odometer; time-of-day clock on CD player/stereo; dual trip meter; low fuel indicator light and mileage countdown feature; low oil pressure indicator light; engine diagnostics readout; LED indicator lights; 6-speed indicator light; cruise control indicator light Indicator Lamps: High beam, running lights, front fender running lights, directional light bar, low oil pressure, engine diagnostics, cruise control, speakers, accessory, security system, 6-speed, low fuel warning, ABS Chassis Brakes: 32 mm, 4-piston fixed front and rear Exhaust System: Chrome, 2-1-2 dual exhaust with tapered mufflers Warranty 2-year unlimited mileage warranty Color(s) Cherry Red Sunglo/Merlot Sunglo Cool Blue Pearl/Vivid Black Dark Candy Root Beer/Light Candy Root Beer Authentic Styling Classic fuel tank: Part of the unmistakable style of the Harley-Davidson® Electra Glide® Ultra Limited motorcycle is plenty of room for showing off your paint. This classically styled, bold six-gallon fuel tank doesn't just give you a bigger canvas for premium or custom paint; it holds six gallons of go so you can eat up a lot more road between pit stops. We know fuel economy is important--but so is style. 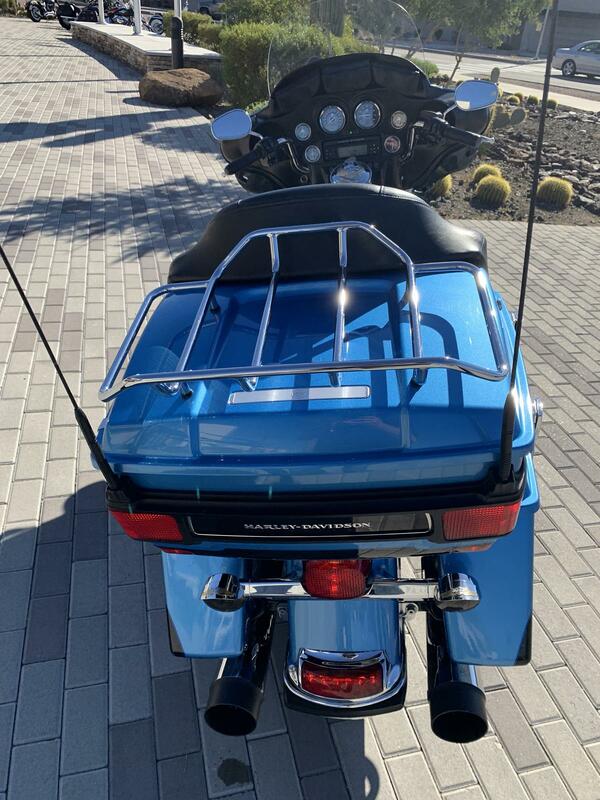 Sharp, eye-catching colors and crisp pinstripes that run the length of the bike from the Shark-Nose fairing to the premium GTX® saddlebags--a one-of-a-kind look for any individual soul. Bat-Wing fairing: Designed by Chief Styling Officer Willie G. Davidson, the nimble, fork-mounted Bat-Wing fairing first appeared on the touring scene back in 1969. And it continues to evolve and symbolize the essence of Grand American Touring motorcycles more than forty years later. The full 8-inch windscreen gives it that classic touring profile and additional comfort. Simply put, the wind is not a factor for the mile-hungry rider who wants to soak up the freedom of the open road for days on end. GTX® saddlebags and Tour-Pak®: These injection-molded hard bags have room for 2.26 cu. ft. volume of long-haul luxuries and a perfect surface for showing off some premium paint. 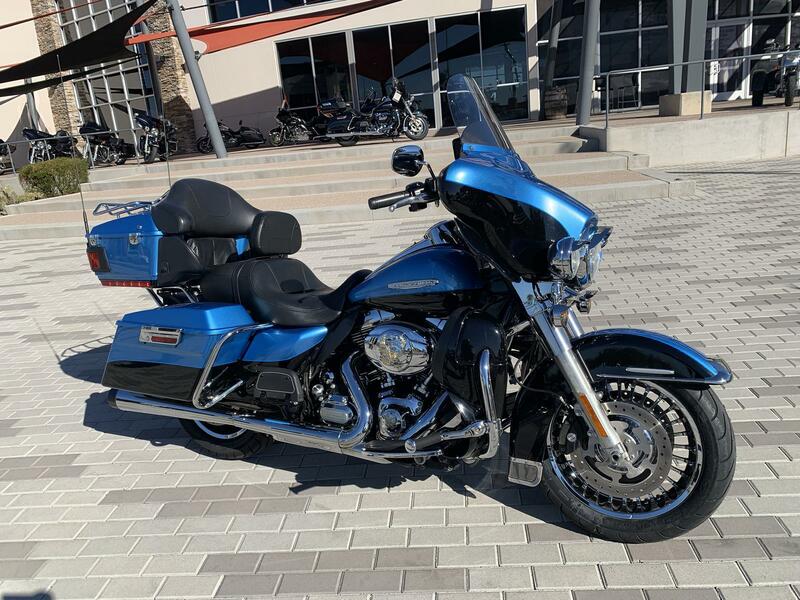 Exclusively on the Street Glide® model, saddlebag latches and hardware are painted to match the bike's color instead of a more chromed-out look. Even better, these saddlebags open from the top, so your gear won't end up spilled all over the highway. They keep your fancy unmentionable dry, and the color-matched latches won't corrode in bad weather. And when you're off the road, one common key starts the bike and gives you access to your saddlebags, keeping your pockets as uncluttered as your bike's classic design. The premium Tour-Pak® luggage carrier is an extra perk, adding to the luxury look and giving you even more space to pack stuff for the road. And we add another layer to the mix with exclusive Harley-Davidson® saddlebag and Tour-Pak® liners. Dual-direction zippers for more access. Side pockets for your quick-reach items like cell phones, keys and toll money. Rubber bottoms that keep the insides dry and clean, and d-rings let you clip on attachments and shoulder straps for easy transport. This is "limited edition" without limits. Large 17-inch front wheel: If you crave long-haul agility on rides of all distances, then you're going to love this. Starting on the 2009 Touring models, we beefed things up a bit, adding a big, mighty wheel with a low aspect ratio. That means the bike maintains its legendary tight turning radius, balanced feel and superior low-speed maneuverability. 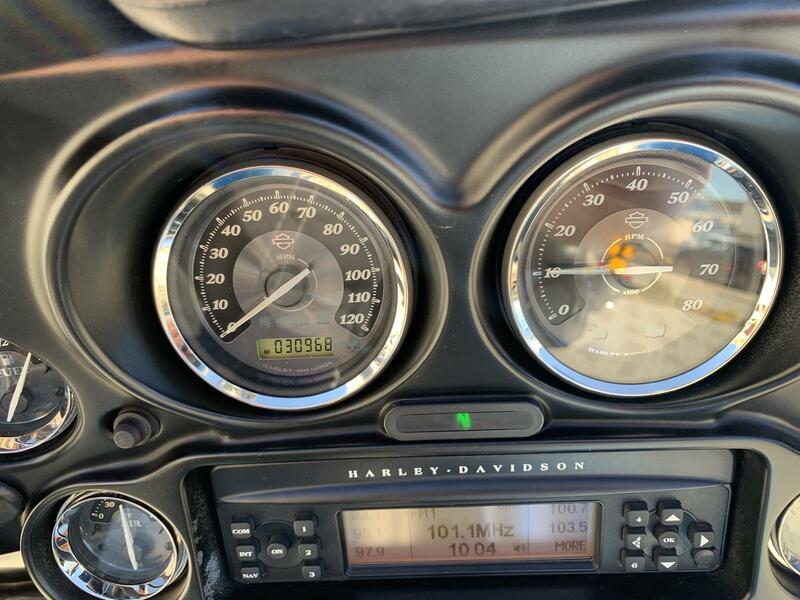 Titanium face gauges: Adding to the rich, custom look of your Electra Glide® Ultra Limited dash are the black and icy cool titanium-colored numbered gauges. White LED backlighting and large, easy-to-read numbers provide at-a-glance viewing while eating up miles of road. Premium and exclusive, these gauges are a must-have. 28-spoke contrast chrome wheels: Premium chrome. Distinctive custom style. These meticulously polished and chrome-plated 28-spoke wheels cast glowing reflections, even while standing still. The process of finishing these wheels is revolutionary, the only way we do things at The Motor Company. Painted gloss black, machined and polished, and then, the exposed surfaces are plated for a brilliant contrast. Special identifier medallions: This isn't just any Touring bike, it's the Electra Glide® Ultra Limited model. It's built to boast, and boast it does with sleek, chromed medallions on the front fender and gas tank. And if that's not quite enough, we fastened one more special identifier medallion on the Tour-Pak® in back for good measure. Premium paint: Up to two times thicker than the competition, custom quality paint comes standard on all Harley-Davidson® motorcycles. Clearcoat layering up to five mils deep. Bigger metal flakes. Unique effects in the pearl colors. Skimping simply is not in our vocabulary. Hand finished fuel tank: All Harley-Davidson® fuel tanks are finished by hand--that's what makes them stand out from the competition. Their seamless design and unmatched style are unique among all motorcycles on the road. 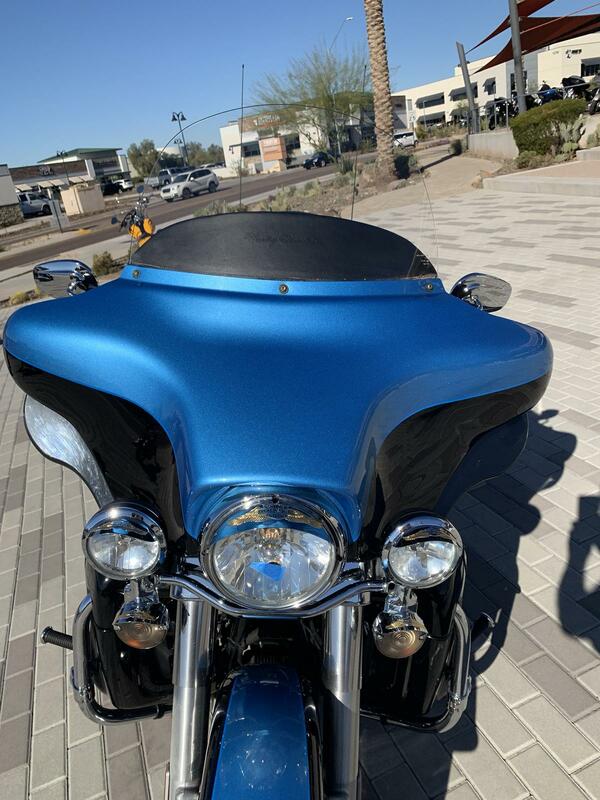 The tanks are one of the first and last things people notice when they lay their eyes on a Harley-Davidson® motorcycle--so we make it worth their time. 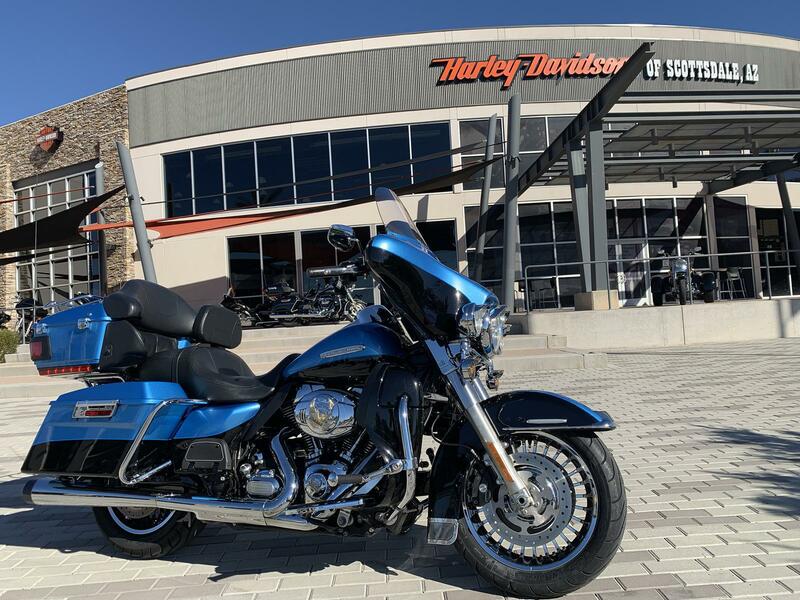 The 2011 Harley-Davidson® Electra Glide Ultra Limited FLHTK is a premium featured touring bike full of authentic Harley-Davidson® grand American touring style. Some of the bike's premium features include: ABS brakes, heated hand grips, titanium face gauges, Tour-Pak inserts, a premium Tour-Pak luggage rack, 28-Spoke contrast chrome wheels, and special Ultra Limited identifier medallions. Also found on the Harley Electra Glide Ultra touring bike is a 6 gallon fuel tank so you have to stop less for fuel. Harley has many other motorcycle touring bikes, all to provide you with comfort and style. 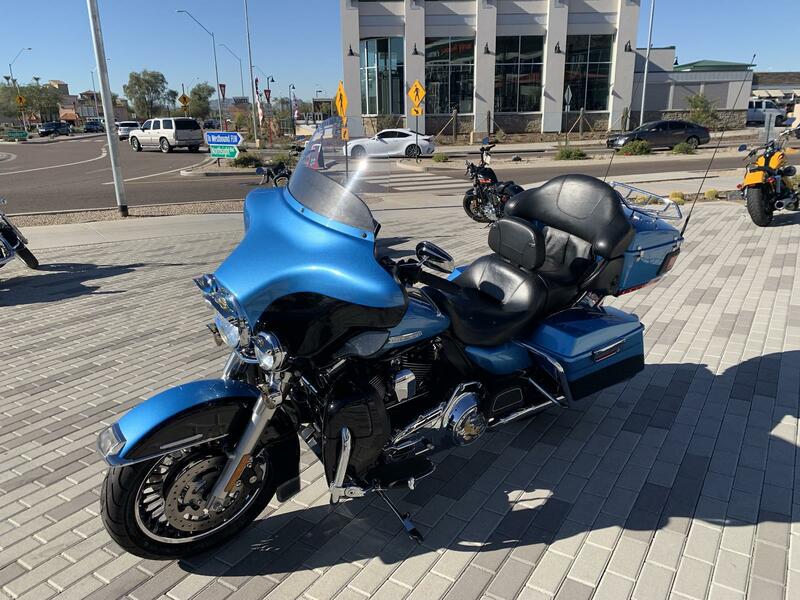 Be sure to look at the new Road Glide Ultra with its frame mounted Harley fairing for your motorcycle travel as well as all of the other Harley touring motorcycles. 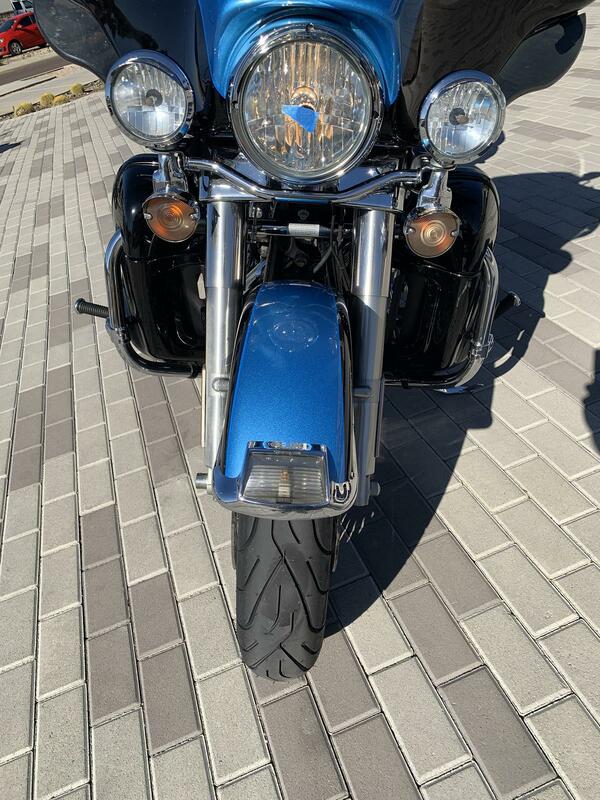 Check out some other Harley-Davidson® motorcycles such as the Night Rod Special motorcycle cruiser, the V-Rod Muscle power motorbike, or the Softail Deluxe motorcycle cruiser. Twin Cam 103™ engine innovation: Fire up the Twin Cam 103™ engine and feel the low-end torque unleashed. Thanks to the lightweight piston design, delivery of the added power is more refined than ever. Then put your foot on the shifter and feel how the engine and Six-Speed Cruise Drive® transmission were designed to work together. Six speeds. A strong driveline and strong internal parts. Low routine maintenance. And a low cruising rpm couldn't feel better. Together with the H-D® Smart Securtiy System and Anti-Lock Brakes, the Twin Cam 103™ engine headlines the "PowerPak" option that comes standard on the Electra Glide® Ultra Limited. Tour-Pak®-mounted 12V power supply: No limits. Only horizons. That's the feeling of a Harley-Davidson® motorcycle. But you may have a few gadgets that disagree. Whether you need a quick charge for your cell phone or power to blow up an air mattress on a lonely stretch of road, knowing you've got 15 amps of power to get through day or night goes a long way. And don't worry about pesky rain spoiling your power supply--the spring-loaded cap keeps the receptor dry and free of road muck. Anti-lock brakes: When it comes to the Ultra Classic® Electra Glide® model with standard ABS, "stopping power" has a double meaning. The components of our ABS are tastefully hidden within the wheel hub, so you'll still turn heads with clean, streamlined designed. More importantly, though you get certainty in the saddle knowing your bike's going to behave when you need it. Heated hand grips: When the chill gets at you, just having a little heat would be nice enough. But this is a Harley-Davidson® motorcycle, and we're all about the details. Our heated handgrips have six settings, so you can easily adjust on the fly for the heat you need with the versatility and control you come to depend on. 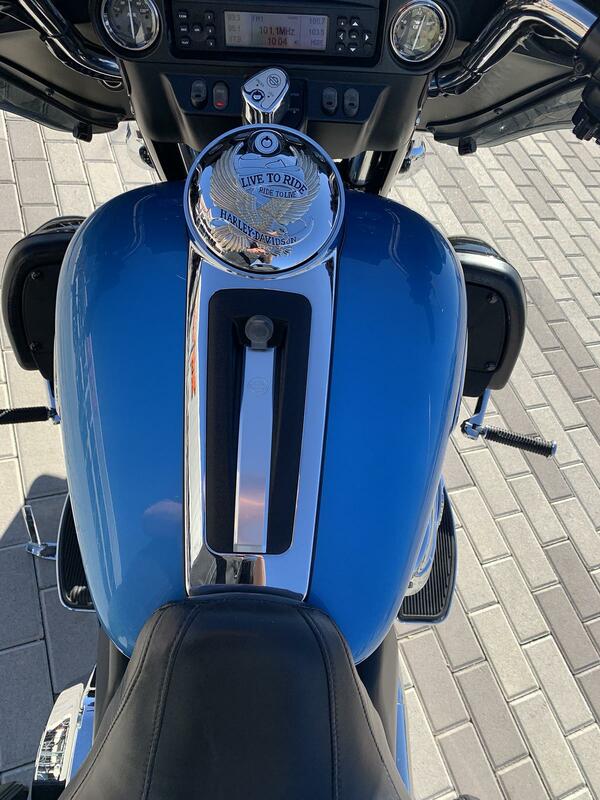 8-inch Ultra windscreen: Beyond the Grand American Touring appearance of this windshield, an 8-inch Lexan® wind splitter is all it takes to keep the wind from getting in the way of you and your ride. Get clear visibility without buffeting, and bit more comfort when the wind really wants to throw you around. Yet another detail that makes our Electra Glide® models the best in class for Touring comfort with long-distance performance. 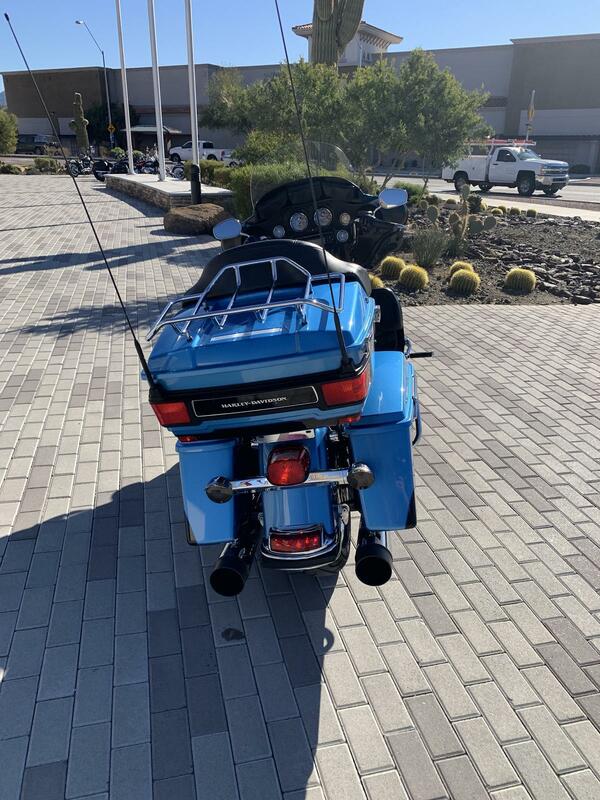 Classic fuel tank: Part of the unmistakable style of the Harley-Davidson® Electra Glide® Ultra Limited motorcycle is plenty of room for showing off your paint. This classically styled, bold six-gallon fuel tank doesn't just give you a bigger canvas for premium or custom paint; it holds six gallons of go so you can eat up a lot more road between pit stops. We know fuel economy is important--but so is style. 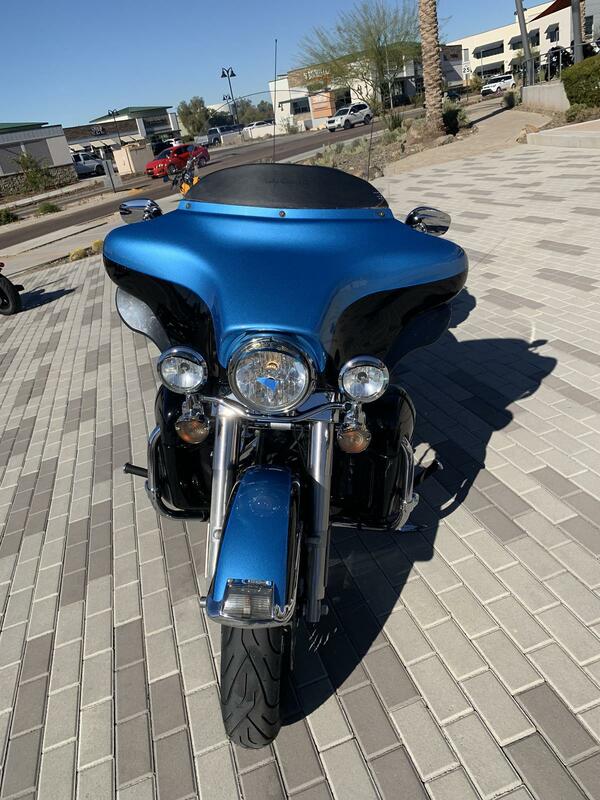 Sharp, eye-catching colors and crisp pinstripes that run the length of the bike from the Shark-Nose fairing to the premium GTX® saddlebags--a one-of-a-kind look for any individual soul. GTX® saddlebags and Tour-Pak®: These injection-molded hard bags have room for 2.26 cu. ft. volume of long-haul luxuries and a perfect surface for showing off some premium paint. 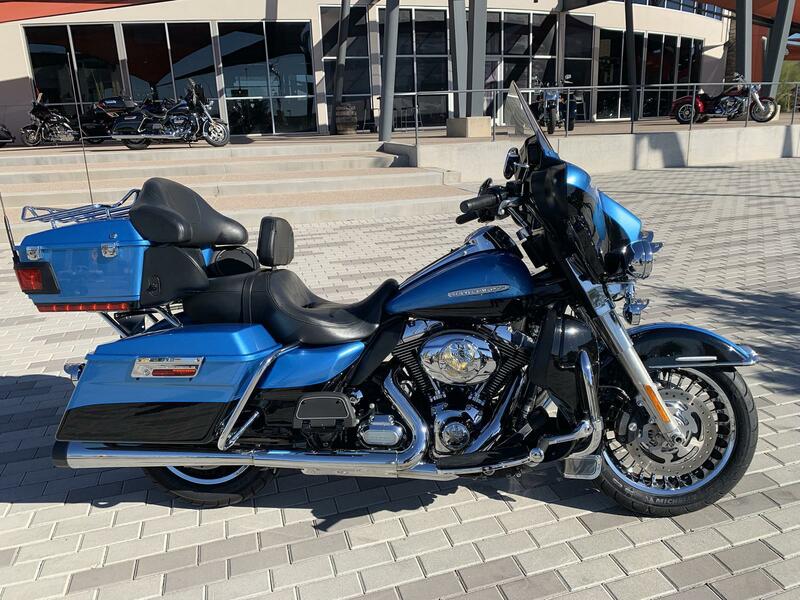 Exclusively on the Street Glide® model, saddlebag latches and hardware are painted to match the bike's color instead of a more chromed-out look. Even better, these saddlebags open from the top, so your gear won't end up spilled all over the highway. They keep your fancy unmentionable dry, and the color-matched latches won't corrode in bad weather. And when you're off the road, one common key starts the bike and gives you access to your saddlebags, keeping your pockets as uncluttered as your bike's classic design. The premium Tour-Pak® luggage carrier is an extra perk, adding to the luxury look and giving you even more space to pack stuff for the road. And we add another layer to the mix with exclusive Harley-Davidson® saddlebag and Tour-Pak® liners. Dual-direction zippers for more access. Side pockets for your quick-reach items like cell phones, keys and toll money. Rubber bottoms that keep the insides dry and clean, and d-rings let you clip on attachments and shoulder straps for easy transport. This is "limited edition" without limits.